Cheetahs, the fastest mammal in the world, are on the brink of extinction according a study published Monday in the Proceedings of the National Academy of Sciences. There are only 7,100 cheetahs globally, and their population has declined rapidly since the late 90s. For example, in 1999 there were 1,200 cheetahs in Zimbabwe. Fast forward 16 years, and only 170 cheetahs are left there. 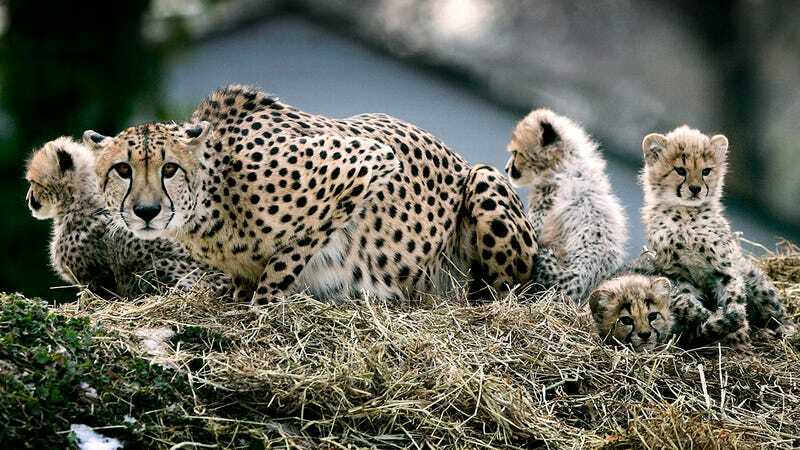 The study, which was led by the Zoological Society of London, Panthera and Wildlife Conservation Society, reported that the cheetah population of Asia had suffered the most. These scientists found “fewer than 50 individuals remaining in one isolated pocket of Iran,” and are now calling for cheetahs to be considered “Endangered” instead of “Vulnerable” on the IUCN Red List of Threatened Species. The cheetah population has declined so rapidly, in part, because they require such a large amount of space for their habitat, “77% of the cheetah’s habitat falls outside of protected areas,” meaning they are extremely vulnerable to “human pressures.” This includes habitat loss due to human development, the illegal trade of cheetah parts and cheetahs as exotic pets, as well as losing their prey due to overhunting by humans. If cheetahs go extinct, it’s because of humans. Correction 12/27/16: An earlier version of this article stated that cheetahs are the fastest animals in the world. The peregrine falcon is in fact the fastest animal; cheetahs are the fastest mammals. The text has been corrected.